Uttarakhand chardham also offer you Kedarnath Yatra. Kedarnath is one of the holiest temple, the Kedarnath Temple, and is a well-liked destination for Hindu pilgrims from all over the world, life form one of the four chief sites in India's Chota Char Dham pilgrimage. The temple was being constructed by Adi Shankaracharya and was advantaged by the name of King Kedar, the leader of Satya Yuga. 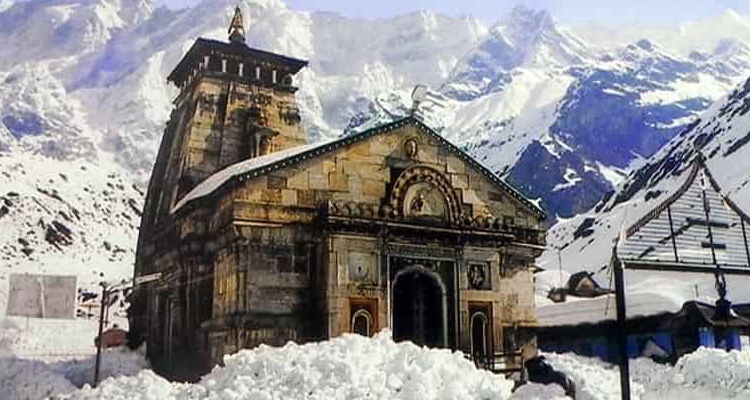 Due to heavy snowfall in winters, the temple is only open end of April to Kartik Purnima… During winters, the idol as of the Shri Kedarnath Dham is carry to Ukhimath and worshipped present for six month. The Kedarnath Temple committee office organizes booking for individual Pooja which is performed before the general Darshan in the morning. Kedarnath Yatra mostly start from Haridwar ( Hari ka Dwar). Kedarnath yatra 2019 Kapat open on 09 May 2019. We have been attending to the needs and necessities of tourists and pilgrims for a long time now. And we really know what satisfy you and what will create you come to Uttarakhand over and once more. If you are involved in a Chardham tour of Uttarakhand, Uttarakhand Chardham is at your service to provide you with the best at a price you would love to pay. Uttarakhand Chardham presents you Kedarnath yatra. We provide you luxury Kedarnath Tour with our best price. Kedarnath Temple is devoted to Shiva and is believed to have been built by Adi Sankaracharya. The beauty of the temple can be qualified to the fact that it is one of the twelve jyotirlingas, current in the nation. It is no wonder that Adi Guru Shankaracharya - a great academic and saint, chose to conserve Lord Shiva in this land, where the unholy becomes only and the holy becomes holier. Here are many Kedarnath Tour providers but Uttarakhand Chardham best option for you because we are give you Tour with lowest rate, drivers are local, good hotel collection all Chardham destination and give you best Tour guide. Nearest place to Kedarnath is Kedarnath, Madhmaheshwar (3289 m), Rudranath (2286 m), Kalpashwar (2134 m), Tungnath (3810 m) these five also know by Panch Kedar. So make a call and you also mail us then we will make your Kedarnath yatra package or Uttarakhand Chardham yatra package with best rate and well facilities. Destination- Delhi- Haridwar- Rishikesh- Devprayag- Srinagar- Rudraprayag- Bhiri- Guptakashi- Sonprayag- Gaurikund- Kedarnath. We pickup you Delhi airport, Railway station, Delhi hotels whatever your locations. We start our tour Delhi and in the way you enjoy the places Gajiabad, Modinagar, Merrut, Khautauli, Mujjaffarnagar, Roorkee, and evening we reached Haridwar. Get the hotel in Haridwar and stay there. Day 2 early morning we take the breakfast and ready to Haridwar to Guptakashi. In the way we show Rishikesh, Byasi, Devprayag, Srinagar, Rudraprayag and evening we reached Guptakashi. Check the hotel in Guptkashi and overnight stay in hotel. Morning drive to Guptkashi to Gaurikund, Trek start from Gaurikund to Kedarnath 16kms trekking. Tour members ought to carry personal medicines, heavy woolen, and tolietteries and dress for and during the night stop at Kedarnath. Check Hotel in Kedarnath. Later stay Kedarnath Temple. Overnight stay. Early morning, pilgrims after Darshan of Kedarnath Temple. Return back to Guptkashi & Drive straight to Guptkashi. Check Hotel in Guptakashi. Overnight stay. Drive to Haridwar via Guptakashi. Check Hotel in Haridwar. Later at evening visit Haridwar Temple for Aarti. Overnight stay. Drive Haridwar to Delhi and drop you at your home/position. Here our Kedarnath yatra end with very best and unforgettable memories. •	Hotel on twin & triple sharing Basis. •	Transportation from Delhi to Delhi by Non AC vehicle. •	All meals (breakfast, Lunch, Dinner) Simple Thali.